The symmetry is approximately mirror image. 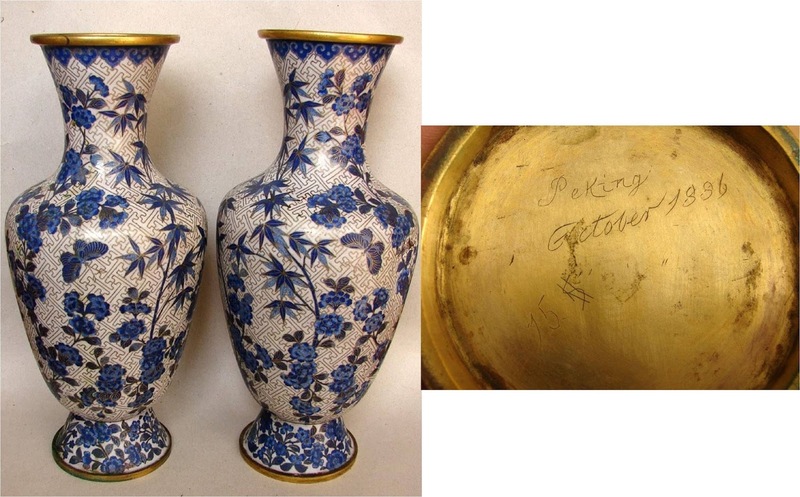 The enameled "CHINA" base mark indicates a date later than the McKinley Tariff Act of 1890, which required a country of origin mark on items imported into the U.S.
Close examination reveals that these vases, although similar in color, display two different methods of rendering the blossom and branch design - for example, in the flower buds and the woody stems. The background of spirals seems to be a 1920s-40s style. The words "Made In" were required by a 1920 Tariff Act amendment for the country of origin stamp. 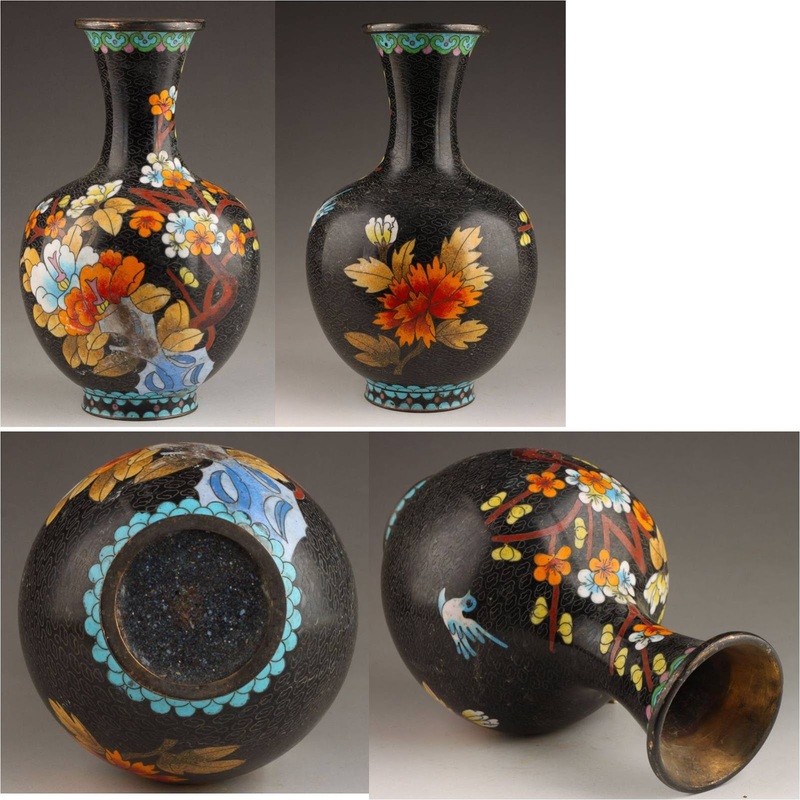 The seller states that the labels were applied by the original owner when she purchased the vase. 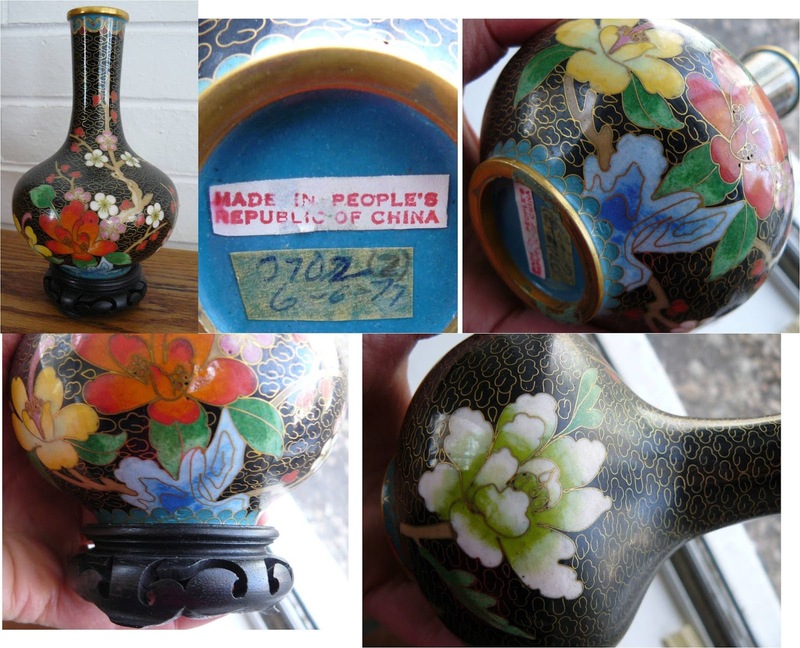 The seller states that he brought this vase back from a visit to China in 1983. 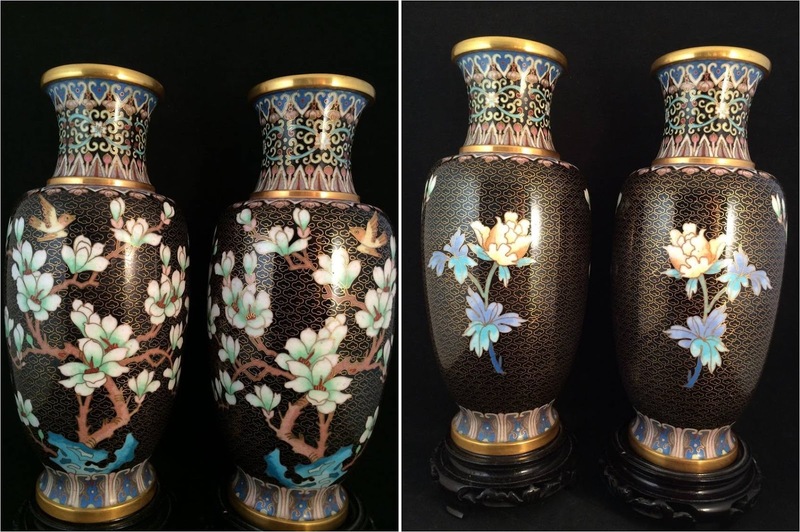 The beige vase is interesting for it's theme - the classic "Three Friends of Winter," plum, bamboo, and pine. 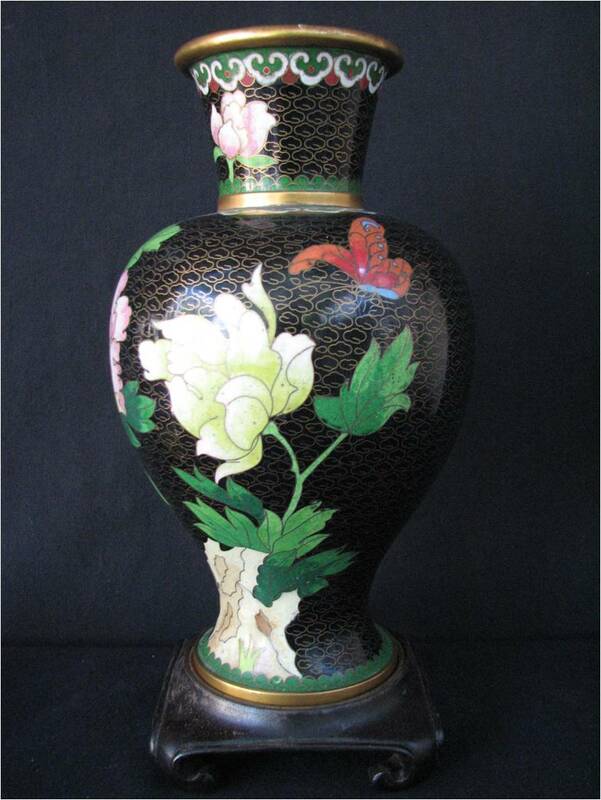 Another Hu-shaped vase appears in a following post on 1960s Chinese cloisonne. 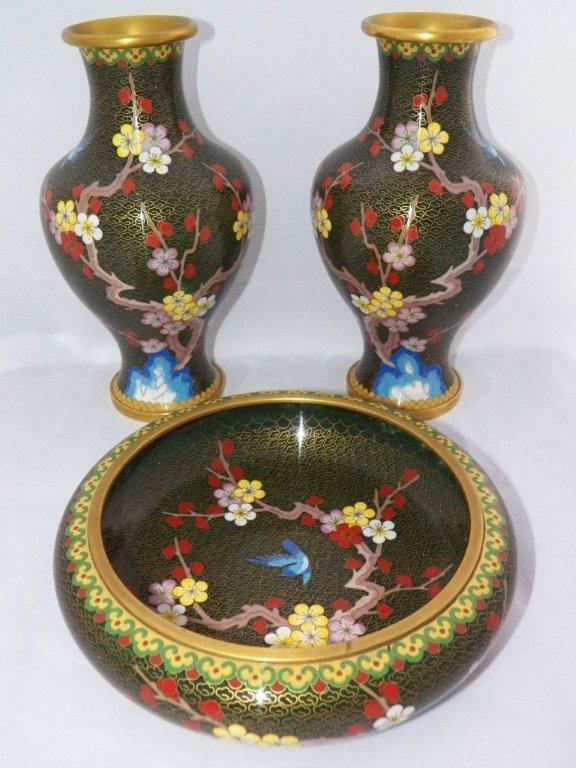 Granite black enamel on base instead of the more usual blue. Note the ornate necks and feet, impeccable craftsmanship. 1980-90s products? When were these items made? 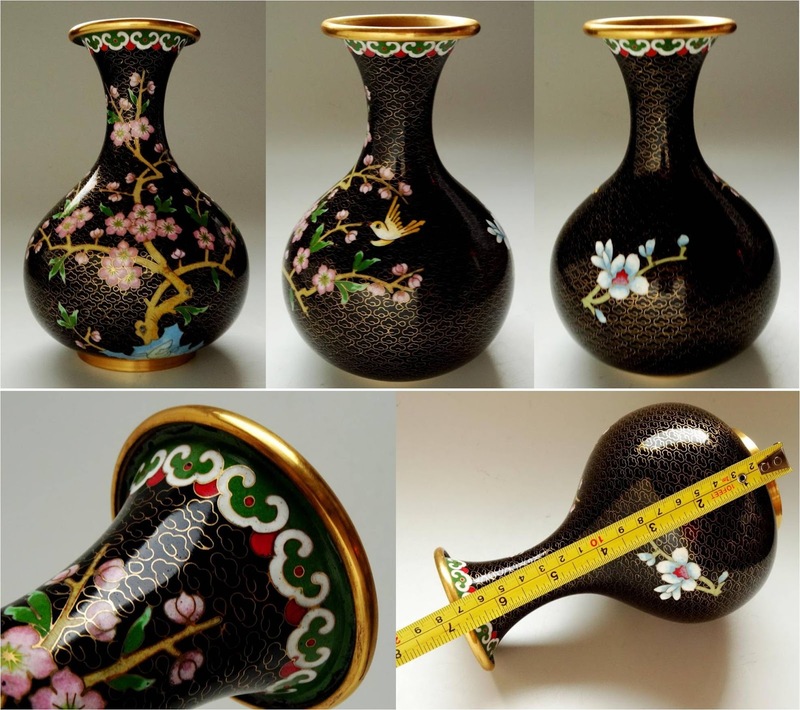 The Beijing Enamel Company was formed in 1958 according to this article on their Web page. 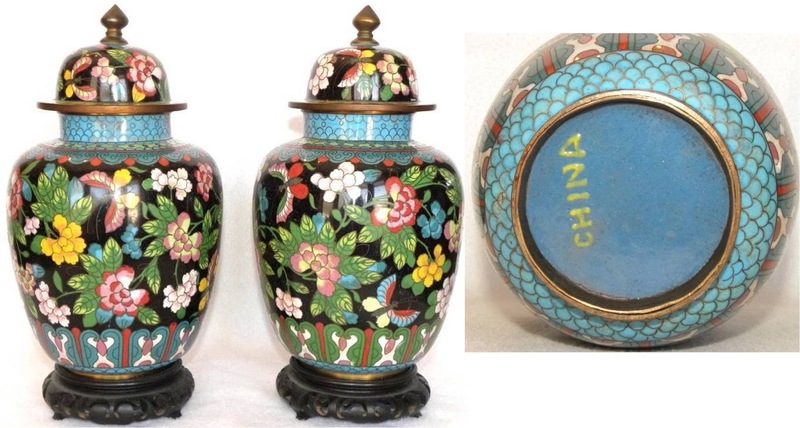 It was a state-supported industry responsible for production of fine cloisonné for sale abroad for the purpose of earning valuable foreign exchange [see extended quote at end of this post]. Foreign exchange, of course, is when you want to buy something from another country and have to use their currency for payment. You have to swap your money for theirs – buy their money. But what if they don’t want your money, because there’s nothing they can use it to buy? It’s not as if you can just waltz out and buy a burger in Alaska with the Hungarian forints left over from your visit to your relatives in the old country, right? The solution, of course, is to start making things that foreigners will want to purchase with the currency you sold to them (“Look at this great embroidered tablecloth I bought in Budapest!”). This of course quickly gets more complicated when an international floating foreign exchange market such as we have now develops. But China’s big problem after 1949 was how to purchase the modern technology they needed, and how to earn the foreign exchange required for these purchases – “We need rubber and steel for tractors, what can we swap for them?” In the 1962 book Escape from Red China the author, Robert Loh, quotes Mao, "One cent of foreign exchange is equal to one drop of human blood." Alas, in 1958 one of China’s best prospects for a supplier and trading partner, the United States, was cut off by a trade embargo put in place as a result of the Korean War in 1950. For various unfortunate reasons this embargo did not end until twenty years later, in 1971. 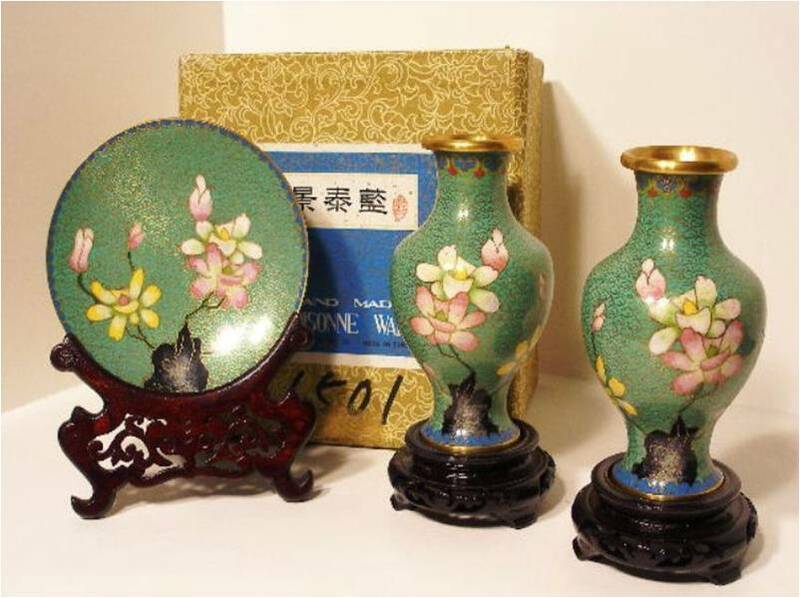 The Beijing Enamel Factory’s website describes how their production earned foreign exchange during the 1970s and early 1980s. After Deng Xiaoping’s economic reforms and support for development of Special Economic Zones along the coast, production then shifted from traditional crafts to … everything else that any international customer might desire. Boom! We all know what happened next. China now has a foreign exchange reserve of nearly $4 trillion. 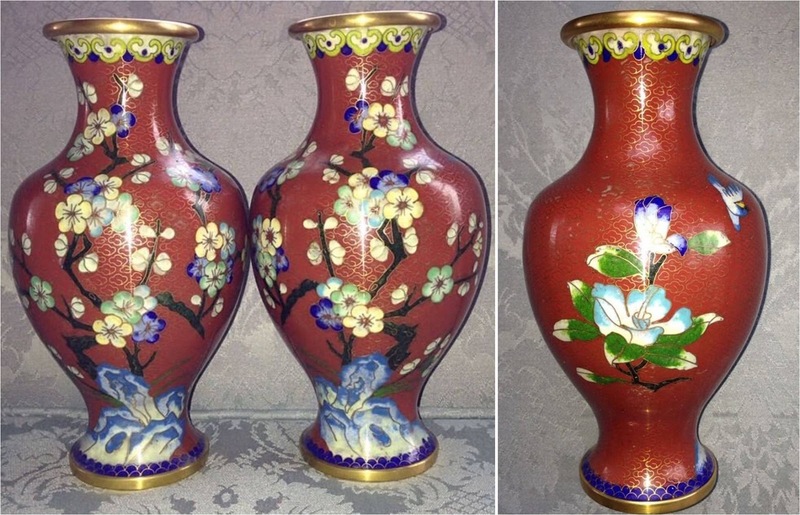 Another account from the Beijing Enamel Factory [click on the Google translate button] relates how Qian Meihua worked to renovate the cloisonné production process and to establish an assembly line system to increase the levels of skill and efficiency. Rather than one master overseeing a shop of journeymen and apprentices, cagily keeping trade secrets close lest his workmen become competitors, she was determined to modernize cloisonné manufacture and publish manuals to make the process open to anyone who wanted to pursue this type of artistry. You can watch this CCTV video [skip to 3:00 to avoid the intro] and see that she and her co-workers succeeded – each separate task in the production sequence is now done by skilled technicians. Many of the above examples are likely from the 1970s and 1980s, when it became possible for more people to visit China. 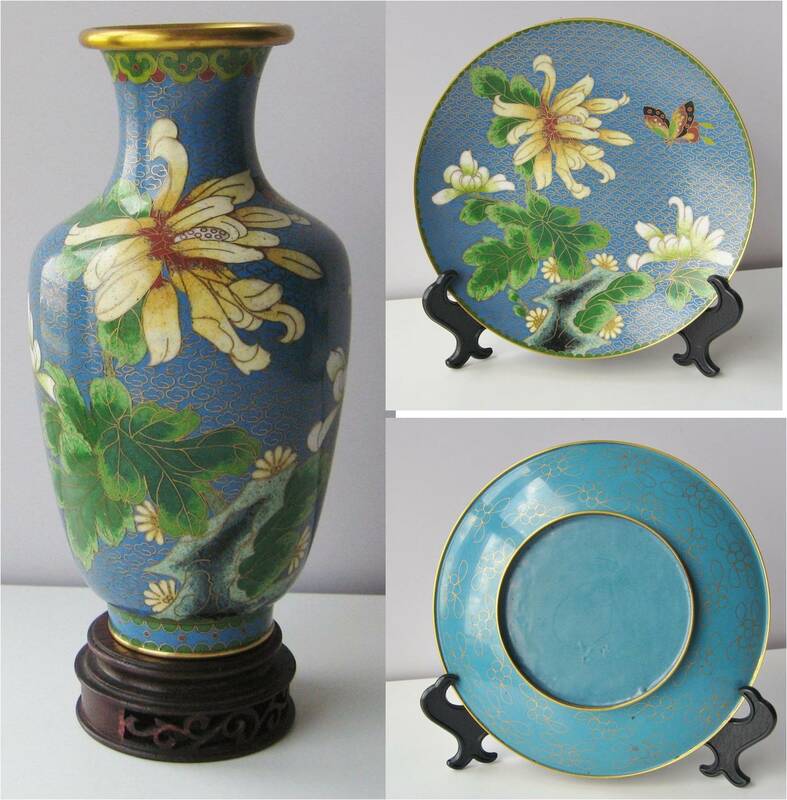 But what happened during the earlier 15 years of the Beijing Enamel Factory, from the mid-1950s through the 1960s? What sort of things did they produce then? in 1949 when the newly liberated our country Baifeijuxing, some equipment, steel mainly rely on imports, then the national shortage of materials, nothing can exchange a lot of foreign exchange. 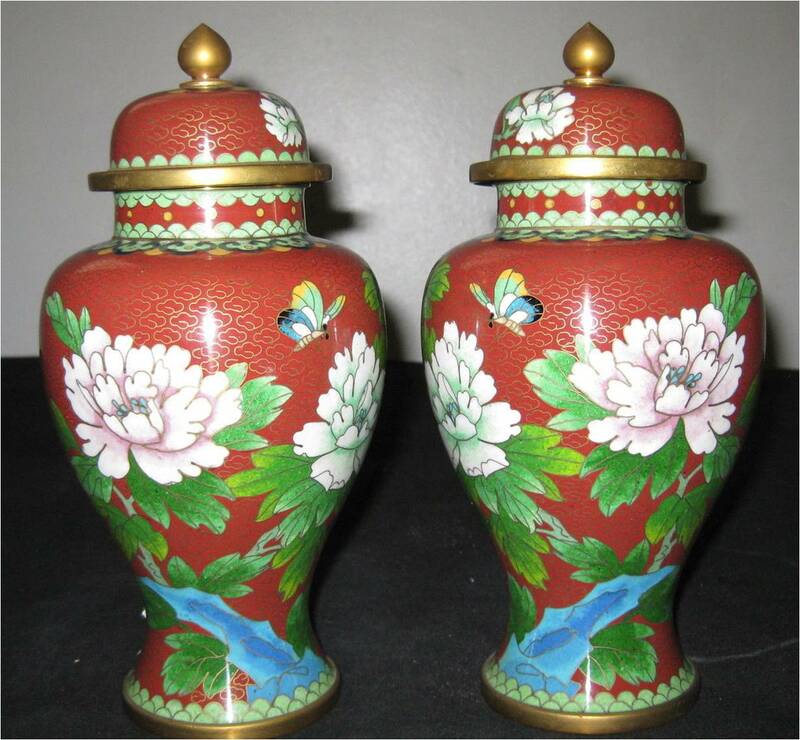 Only the higher arts exchange rates, Beijing will use its own national characteristics, open market with cloisonne, ivory, jade, gold lacquer such specialty products. 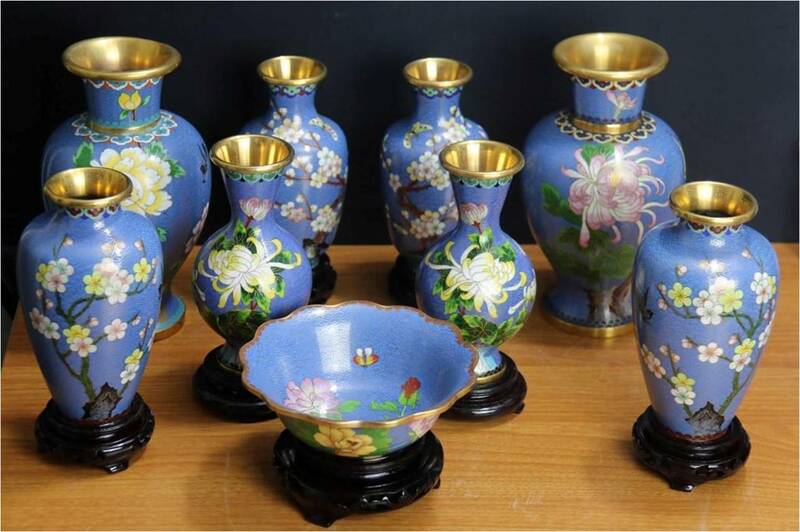 Then export large Beijing Enamel Factory became Beijing, half of the foreign trade products are cloisonne, marketing the world's five continents in more than 100 countries and regions. 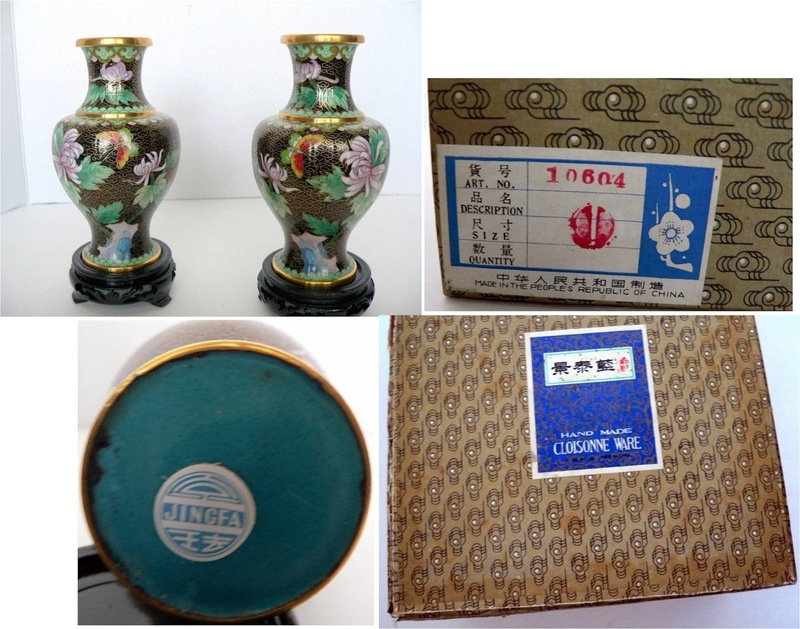 After entering the eighties, cloisonne exports peaked in 1980 and 1981, reaching a record level, with an annual export volume of more than $ 10 million. In December 1978, during the Third Plenum of the 11th Central Committee Congress of the Communist Party of China, Deng took over the reins of power. To reassert his economic agenda, in the spring of 1992, Deng made his famous southern tour of China, visiting Guangzhou, Shenzhen, Zhuhai and spending the New Year in Shanghai, using his travels as a method of reasserting his economic policy after his retirement from office. On his tour, Deng made various speeches and generated large local support for his reformist platform. He stressed the importance of economic reform in China, and criticized those who were against further reform and opening up. Although there was a debate on whether or not Deng actually said it, his perceived catchphrase, "To get rich is glorious" (致富光荣), unleashed a wave of personal entrepreneurship that continues to drive China's economy today.